Ed Emberley was born on October 19,1931. In honor of his birthday, this month's project is a thumbprint palm leaf book. I'm a big fan of Ed Emberley's picture books and especially appreciate everything he has done to bring art to all of us through his drawing and thumbprint books. Happy birthday Ed and thank you! I made my palm leaf book from a cereal box panel. Younger children may have difficulty cutting and punching something that thick. Two solutions: Glue together two sheets of copy paper with writing on one side with the written sides facing each other or prepare the pages ahead. I used a piece of netted plastic from a tomato bag for the string. The beads at the end are cut out thumbprints on cereal box. A couple of suggestions about the stamp pad: washable is a good idea (not what I used as my brown thumb shows). If you are using multiple colors with a group, you might want to make small groups and assign each child a color to print. Otherwise there's wiping to do in between each color. I'm a follower and I would like to share with you the books of my little ones, we blogged today one of their books. I write in spanish and I have a translator in the top left column. We LOVE Ed Emberley. The Mom was giddy to share his work with The Sisters... now it's pretty normal to find thumbs and fingers stained with ink around here! Thanks for reminding us, we'll take out his books this week... and have some fun. I can see thumb pumpkins!! P.S. We've really enjoy your blog and ideas --we home school and love the inspiration! Thanks so much. 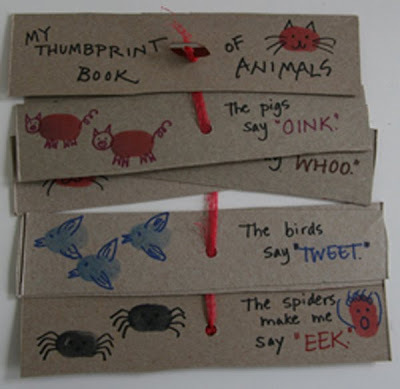 If you'd like to share the books you make on facebook, please go to Making Books. I have used Ed Emberley books for years in my pre-k classroom! They are great for one step directions and following left to right. Thanks for the reminder of this talented man's birthday.